Rotary Club of Bridport - Welcome! Bridport Primary School winners from L - R. Speaker Roland Ross, Chair William Dacey and Proposer Kitty Rumens. President Bernard Paull is standing behind them. Please scroll down for more information on Rotary, joining us, upcoming meetings, avtivities, and events. Being a member of Rotary is not just about fund raising, but being able to use our skills to help others, support local and world wide charities, meet new people and of course have some fun. It is always easier to help others when you are having a good time doing it. During the year we enjoy several social and sporting events with other Rotarians, partners and guests. These occasions allow us to meet like-minded people and develop friendships. 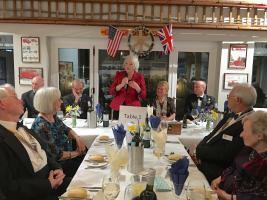 The Rotary Club of Bridport is a friendly group of 33 members, men and women, and we welcome new members and guests. Do come and join us. Would Rotarians planning to make a visit please contact us a day or two before. Interested but want to know more? Then why not consider becoming a "Friend of Rotary"? Oh yes... have some fun as well as getting satisfaction from a job well done. Like to volunteer or ask more questions? President Chrissie invited members and friends to celebrate the end of her year in office. The speaker Kate Adie a patron of Hope and Homes for Children and famous journalist and foreign correspondent talked about her career and Hope & Homes for Children. Usually at Highlands End Holiday Park except for about a month during the summer holiday season, when venues may vary.